Synthetic peptide corresponding to Mouse PITX3/PTX3 aa 1-100 conjugated to keyhole limpet haemocyanin. Western blot blocking was performed with 5% milk. Our Abpromise guarantee covers the use of ab30734 in the following tested applications. WB 1/250. Detects a band of approximately 35 kDa (predicted molecular weight: 32 kDa). Abcam recommends using 5% milk as the blocking agent. Transcriptional regulator which is important for the differentiation and maintenance of meso-diencephalic dopaminergic (mdDA) neurons during development. 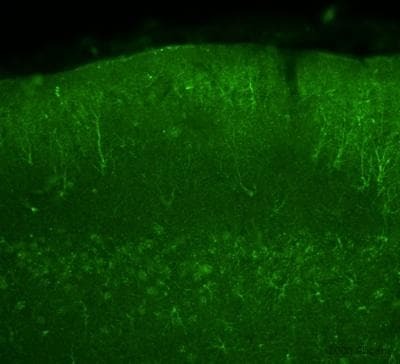 In addition to its importance during development, it also has roles in the long-term survival and maintenance of the mdDA neurons. Activates NR4A2/NURR1-mediated transcription of genes such as SLC6A3, SLC18A2, TH and DRD2 which are essential for development of mdDA neurons. Acts by decreasing the interaction of NR4A2/NURR1 with the corepressor NCOR2/SMRT which acts through histone deacetylases (HDACs) to keep promoters of NR4A2/NURR1 target genes in a repressed deacetylated state. Essential for the normal lens development and differentiation. Plays a critical role in the maintenance of mitotic activity of lens epithelial cells, fiber cell differentiation and in the control of the temporal and spatial activation of fiber cell-specific crystallins. Positively regulates FOXE3 expression and negatively regulates PROX1 in the anterior lens epithelium, preventing activation of CDKN1B/P27Kip1 and CDKN1C/P57Kip2 and thus maintains lens epithelial cells in cell cycle. Highly expressed in developing eye lens. Defects in PITX3 are a cause of cataract autosomal dominant (ADC) [MIM:604219]. Cataract is an opacification of the crystalline lens of the eye that frequently results in visual impairment or blindness. 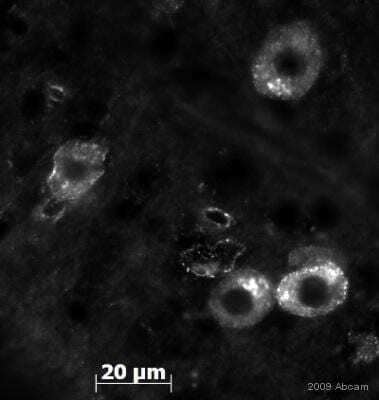 Opacities vary in morphology, are often confined to a portion of the lens, and may be static or progressive. In general, the more posteriorly located and dense an opacity, the greater the impact on visual function. Cataract is the most common treatable cause of visual disability in childhood. Defects in PITX3 are a cause of anterior segment mesenchymal dysgenesis (ASMD) [MIM:107250]; also known as anterior segment ocular dysgenesis (ASOD). ASMD consists of a range of developmental defects in structures at the front of the eye, resulting from abnormal migration or differentiation of the neural crest derived mesenchymal cells that give rise to the cornea, iris, and other components of the anterior chamber during eye development. Mature anterior segment anomalies are associated with an increased risk of glaucoma and corneal opacity. Conditions falling within the phenotypic spectrum include aniridia, posterior embryotoxon, Axenfeld anomaly, Reiger anomaly/syndrome, Peters anomaly, and iridogoniodysgenesis. Defects in PITX3 are the cause of cataract posterior polar type 4 (CTPP4) [MIM:610623]. A subcapsular opacity, usually disk-shaped, located at the back of the lens. It can have a marked effect on visual acuity. Some patients affected by cataract posterior polar type 4 can present a severe phenotype including microphthalmia and neurological dysfunction. Belongs to the paired homeobox family. Bicoid subfamily. Additional bands at: 160 kDa, 26 kDa. We are unsure as to the identity of these extra bands. 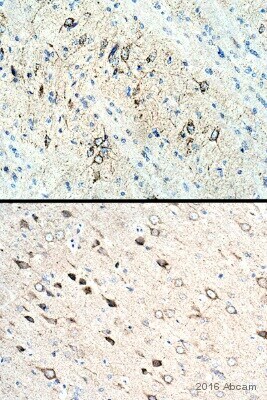 ab30734 staining PITX3/PTX3 in mouse brain tissue section by Immunohistochemistry (PFA perfusion fixed frozen sections). Tissue from 4% PFA perfused animals underwent overnight fixation in 4% paraformaldehyde, cryoprotected in 30% sucrose and cut using cryostat.The primary antibody was diluted, 1/300 (PBS + 0.3% Triton X100) and incubated with sample for 18 hours at 20°C. An abcam antibody ab60314, Chromeo 488 conjugated goat polyclonal to rabbit IgG, diluted 1/1000 was used as secondary. Publishing research using ab30734? Please let us know so that we can cite the reference in this datasheet. I have annother inquiry about some peptides. Are there blocking peptides available for the flowing two antibodies, the ab134920 and the ab30734? 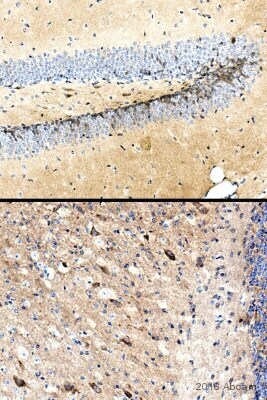 Concerning Anti-PITX3 antibody - Neuronal Marker (ab30734) and Anti-PITX3 antibody [EPR8868] (ab134920) I am happy to be able to offer you a blocking peptide for both of the antibodies: ab31696. https://www.abcam.com/index.html?datasheet=31696 (or use the following: https://www.abcam.com/index.html?datasheet=31696). I can confirm that the Human PITX3 peptide (ab31696) can be used as blocking peptide for both antibodies because they share the same immunogen.